Find the best OneSeed Expeditions trips. From Nepal to Colombia, TourRadar offers 18 tours through 7 countries from OneSeed Expeditions. The tours span across 7 day to 19 day itinerary with prices ranging between $126 to $656 per day. "First of all Torres Del Paine is fantastically beautiful. 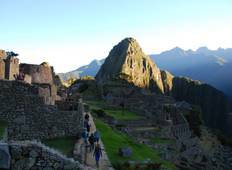 Combine that with perfect..."
"OneSeed made my trip in Peru (Salkantay Trek) "Ultimate Machu Picchu" unforgettable...."
"This was our first trek, one seed was fantastic. There was a never ending list of..."
"Our experience with OneSeed was awesome. The trip was exactly as advertised, discussed..."
"The activities were great, we loved Saul, our guide, and the country was beautiful...."
"I had a marvelous Guide Jjheigl & his crew who went out of their way to ensure everyone..."
"Simply the best! Wonderful from start to finish. The guides, the staff, the journey...."
"Everything went off without a hitch! All the expectations were met and exceeded by..."